← What Do We Do About Workplace Liars? Let me begin by saying that my political opinions couldn’t possibly be farther from Dinesh D’Souza’s unless he suddenly abandoned the Republican Party in favor of the Nazis. Not that I’m accusing the arch-conservative of being a Nazi. He’s not. He’s a self-described Christian conservative. I don’t think most of the Christians I worship with would recognize his brand of hateful rhetoric as having much to do with Christianity, however. I’m a proud progressive who volunteers to raise money for Democratic candidates, and supports a wide range of causes and organizations that D’Souza finds offensive. Nonetheless, yesterday I drove for over an hour in a thick fog to deliver a child actor to a film location where D’Souza was shooting his latest propaganda film, Stealing America. The aspiring actor also happens to be studying civics in school this year. Being the good, broad-minded grandparent I am, I replied that he should never do any part that violated his conscience – but that I’d support his choice, even if I disagreed with the lines his character had to say. I never thought I’d be forced to put my words into action quite so fast. But on Friday of last week, one of the top casting agencies in the state asked for his availability for a role as a background player in a film. He was available, and on Monday, they called to tell him he’d been cast. Then, of course, I used a search engine to find out what I could about the film, and found that the film is for Mr. D’Souza’s latest rant against President Obama, Hilary Clinton, and the Democratic Party. Generally, I screen the film roles our child actor is allowed to accept for content before he is cast – there are some things we just don’t want our child doing, even on film. This would have fallen under the general heading of “offensive content” that I don’t really want anywhere close to my family. Except for the fact that I’d opened my mouth just last week and promised to let HIM decide whether something violated his conscience or not. So I reviewed Mr. D’Souza’s website with him, and we decided to go ahead and do the film since he had no lines that were offensive. Here’s what his website says about Stealing America. “What do the Democratic Party and a gang of criminals have in common? Funny you should ask! “In the fall of 2014, outspoken pundit, author, and filmmaker Dinesh D’Souza found himself hauled into federal court for improperly donating money to a friend who was running for the Senate. “D’Souza pleaded guilty, apologized for his offense, and was sentenced to eight months in a state-run confinement center near his home in San Diego. In the facility, he lived among hardened criminals—drug dealers, thieves, gangbangers, rapists, and murderers. “Previously, D’Souza had seen America through the eyes of a grateful immigrant who came here as a student and became successful by applying and defending conservative principles. Again and again, D’Souza made the case that America is an exceptional nation, fundamentally fair and just. 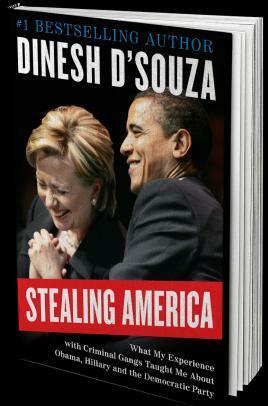 “D’Souza’s prolonged exposure to the criminal underclass provided an eye-opening education in American realities. In the view of hardened criminals, America is anything but fair and just. Instead, it is a jungle in which various armed gangs face off against one another, with the biggest and most powerful gangs inhabiting the federal government. “Applying this hardboiled perspective to American politics, D’Souza saw that America is becoming less exceedingly exceptional every day. Indeed, it is in danger of becoming just like India and other corrupt third world nations, run by gangs of kleptocrats. As for American liberalism, it is not a movement of ideas at all; it is but a series of scams and cons aimed at nothing less than stealing the wealth of the American people. I was surprised when I saw some of the local actors waiting for their own parts in the movie. Some were college students just looking for a paycheck for a day of work. Some were brand-new actors looking for material for a demo reel. The remake of Roots is filming in Louisiana, and a lot of the same actors had worked on Roots, it seemed. To them, it was just another costume drama – except that the slaves in D’Souza’s film were uniformly dressed in clean, pretty clothing, complete with shoes. The barefoot slaves (actors) in Roots didn’t look nearly as stylish, I am sure. When I showed her the description of Stealing America from D’Souza’s website, her eyes got big and she said, “My mama is gonna kill me!” But she was already in costume, and soon after our conversation, they called her to the van that was taking people from the staging area to the set. It’s important to note that most extras and crew members never see a script – they just show up and do their job, then go home and wait for a check in the mail. I feel sure that most of the people we saw in the staging area were simply bit players who had worked on the LBJ movie yesterday, Roots the week before, and would migrate to the next film set today or tomorrow. Politics was probably the last thing they were thinking of when they accepted the job. My teenager didn’t get away with spending a day on the set and coming away without at least an understanding of why I found the material to be so hateful, and how his experience on set fit in with his civics lessons. One of his assignments this week is an essay on the pros and cons of the First Amendment’s protection of free speech, regardless of the actual content of that speech. In researching that, he had just read an LA Times op/ed article called Sorry, kids, the 1st Amendment DOES protect ‘hate speech’. When we first began our discussions of the Bill of Rights in last week’s civics lessons, he wondered why hate speech was legal, and why groups like the American Nazi Party and the Ku Klux Klan were allowed to stage protests. His initial reaction was that they shouldn’t be allowed to march because it might lead to violence, and their ideas were hateful. I pointed out that many of our Quaker friends have strong political beliefs that are unpopular in Texas, such as being against the death penalty or the wars in the Middle East. I asked if the anti-war protesters should be allowed to march, and he said “yes”. Then I asked if the pro-war protesters should be allowed to march, and he also said “yes”. So I asked who decides who can march in support of a political idea, and who can’t? After briefly toying with the idea of becoming the King of the World and deciding everything for everyone, he admitted that he didn’t like the idea of anyone deciding whose ideas had value, and whose did not. Which, of course, brought us back to Mr. D’Souza and the 1st Amendment. We concluded that we are glad we live in a country where we can support the causes we believe in, and others can support theirs. That it’s good that Mr. D’Souza’s hateful words provided work for several hundred Texans who needed jobs – even if they had no idea what kind of film they were making. I still think his book and film are pure propaganda designed to promote ideals that I find abhorrent. But, I support his right to his hateful ideals – and my own right to argue just how hateful they are. I’m glad this film came up while my child was studying the First Amendment in civics class, and I’m glad we got the chance to discuss our family’s beliefs and how they are different than Mr. D’Souza’s beliefs. So I guess I own him a thank-you, even though I won’t be buying the book. Mr. D’Souza’s diatribes against progressives helped me show my teenager why our country allows hateful speech. Perhaps the experience even went some distance towards convincing one teenager that he never wants to be a right-wing conservative. My husband, after all, swears that sharing a college dorm suite with Texas Republican Congressman Pete Sessions (at Southwestern University a private Methodist-affiliated school in Georgetown, Texas) convinced him to become a Democrat. So I have hope that early exposure to D’Souza’s rants will nudge at least one teenager toward the left, too. UPDATE March 15, 2016: The trailer for this film made its debut at CPAC this week, and it’s been renamed. It’s called Hilary’s America: The Secret History of the Democratic Party, and has been edited to claim that there is a conspiracy to hide the past history of the Democratic Party from voters. Of course, anyone who paid attention in history class knows that the two major U.S. political parties have reversed their position on racism and civil rights so that the party of Abraham Lincoln is now being led by Donald Trump, while the party of the Dixiecrats is now led by Barack Obama. Guess they didn’t teach much American history where Mr. D’Souza went to school — as he seems to think he’s making some kind of huge revelation by laying charges of past racism against the Democratic Party. The film will be released in July, 2016, and the trailer is now on YouTube. Gallery | This entry was posted in Family, Law and tagged Dinesh D'Souza, Dinesh D'Souza Hilary's America, Dinesh D'Souza Stealing America, Dinesh D'Souza's hateful rants, Dinest D'Souza's The Secret History of the Democratic Party, hate speech, Stealing America, Stealing America book, Stealing America film, why the First Amendment allows hate speech. Bookmark the permalink.